Every devotee of Gurudev wears a “Kada”. Normally a person is blessed with the “Kada” on his first visit to the Guru-Sthaan itself. The “Kada” enables a physical and spiritual link with Gurudev. It also provides a link of the body with the soul (physical and spiritual link). The powers of “Shakti” in the “Kada” pulls out the problems of a person. The problems that are pulled out, need to be submitted to a power that can handle them. They are submitted (“samarpit”) to the powers of Lord Shiva which are also present in the “Kada”. The “Kada” also provides an all time protection to the person wearing it even when the person is physically at a distance from Gurudev, because through the link of the “Kada”, Gurudev is spiritually always present for the help of His children. The Scientific Importance of the “Kada” : People use stabilizers for all machineries and electrical equipment in their homes, but ignore their body, which is the most intricately built sensitive machine of GOD. The atmosphere is full of cosmic rays which come from the Sun and other heavenly bodies. Every person’s resistance in terms of these rays is different. It can be understood in a simple way – some people can withstand heat much more than others OR, some have a stamina against infections more than others. The “Kada” is like the Stabilizer for the Human body. It provides a balance of the cosmic rays present in the atmosphere, in our body. It can be clarified further – People say that if water is kept in a copper container, it becomes good for health. It is because, water absorbs traces of copper, which go in the body and provide resistance power to it. 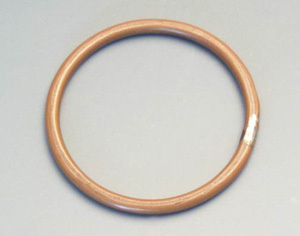 Similarly, when we wear the “Kada”, the copper which remains in constant contact with the body, is very slowly absorbed by the body, through the skin, thereby providing it the necessary resistance power. Very small traces of silver are also absorbed by the body which are very good for the body and this is a scientific fact. Another example of the benefits of copper can be understood as follows – In very tall buildings, a Trident of copper is placed on the terrace and a thick copper wire attatched to it, goes all the way into the ground. It is because, copper is a good conductor of electricity and thus provides protection to the buildings against lightning. In case of lightning, the copper Trident on top of the building, absorbs the entire impact, and passes it to the ground through the thick copper wire attatched to it, thereby earthing the entire current and protecting the building. The material which can protect tall buildings against natural calamities, think what it can do for our body. And when it is blessed by Gurudev, with all the scientific benefits, it also starts carrying His spiritual powers, the “Kada” works as an all round protection shield for the person wearing it.